As President Donald trump continues to remake his cabinet and White House staff, don’t count out former New Jersey Governor Chris Christie as someone the President will tap for a key position. The President is getting rid of, for the most part, initial appointments that he made on the recommendations of others—mainly to soothe the DC establishment. The personnel and staff being handed their walking papers or coaxed into resigning are mainly individuals such as Secretary of State Rex Tillerson and National Security Advisor General H.R. McMaster, who have been sniping at Trump ever since the President’s inauguration. Others, like Communications Director Hope Hicks had lesser falling outs with the President, but were made to feel unwelcome. Besides Tillerson, McMasters, and Hicks; there are others with their heads on the chopping block—White House Chief of Staff John Kelly and Attorney General Jeff Sessions are two of the more prominent individuals awaiting departure. The only thing holding Sessions in place are Trump’s attorneys handling the Special Counselor Robert Mueller’s probe. Trump can’t give Mueller any reason for pressing an obstruction of justice charge—firing the Attorney General whose office oversees the Special Counsel is too risky. Be assured, when the Mueller Probe concludes, Sessions will be canned. Chief of Staff John Kelly is another staffer under Trump’s skin. He’s grown to be a nuisance to the president, who has publicly sniped at his top confidant. The recent scandal regarding White House Aide Rob Porter’s failure to be properly screened for domestic abuse incidents can be laid on Kelly’s doorstep. Trump took plenty of heat over the Porter incident. When time runs out for either Kelly or Sessions, former New Jersey Governor Chris Christie, one of Trump’s initially strongest supporters, may rise again like a phoenix from the ashes. Christie, now an ABC news analyst is being given a second look by Trump. The former New Jersey Governor didn’t pan out in the first round of Presidential appointments, mainly due to interference from Trump’s son-in-law Jared Kushner. In his tenure as United States Attorney for New Jersey, Christie had prosecuted and humiliated Kushner’s father. Trump is becoming less and less enamored with his son-in-law, not clearing security protocol was another bad mark for Kushner. Sessions, Kelly, and Kushner’s missteps are lining up like stars for Christie, who didn’t survive the hatchet job the first time around. This time will prove different, since the hatchet wielders are being hacked apart themselves. The prediction: Christie moves up to White House Chief of Staff or Attorney General. Corruption at DOJ Exposed One thing becoming more and more apparent by means of two Congressional investigations and another by the Inspector General is that there still remains abhorrent corruption residing in the Department of Justice and the FBI. The conduct documented of former FBI Director James Comey, Deputy FBI Director Andrew McCabe, and Investigator Peter Strzok are shamefully dangerous to the country. What you are about to learn in the next few months is that these holier-than-thou phonies have been using their positions to run their own political ward club within the confines of the Justice Department. They conspired to obstruct justice by ensuring that the investigation—excuse me, ‘matter’—regarding Democratic Presidential Candidate Hillary Rodham Clinton’s compromised emails, when she served as Secretary of State, was predetermined to exonerate her of any wrongdoing, no matter what the evidence would show. 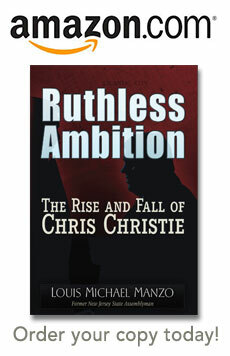 Some of the methods employed were methods that I initially exposed in my book Ruthless Ambition: The Rise and Fall of Chris Christie. Methods such as rewriting FBI 302 reports, falsifying evidence, and destroying evidence not agreeable to the outcome that prosecutors and investigators were seeking. This cabal further conspired to attempt to frame the Campaign of Republican Presidential Candidate and then President-elect Donald Trump for any alleged crime they could stick to him. For this purpose, these stellar prosecutors knowingly used a phony dossier constructed by a former British spy and paid for, in part, by the Democratic National Committee in order to dupe a United States Foreign Intelligence Surveillance Court Judge into issuing a surveillance warrant on key personnel in the Trump campaign. Sorry to say, but it is becoming more and more apparent that Judge Rudy Contreras, who recused himself after the fact, may have been a willful accomplice of Peter Strzok. The obviously s***-for-brains Strzok laid out the entire plot in a series of emails with his DOJ lover. And this guy has a security clearance? Special Counsel Robert Mueller and his pit-bull prosecutor Andrew Weissman are no strangers to prosecutorial misconduct, they both seem to have a penchant for never seeming to find any exculpatory evidence of their prosecution targets as being deemed not worthy of destroying or hiding. Weissman made a career of misconduct. According to the United States Fifth Circuit Court, Weissman and other prosecutors in United States v. Brown sent four Merrill Lynch executives to prison for a year on an indictment alleging conduct that was not criminal while the prosecutors “plainly suppressed” evidence favorable to the defense. Weissman also was part and parcel of the corrupt prosecution of the late United States Senator Ted Stevens of Alaska, that was likewise overturned. Weissman was also a part of the corrupted prosecution of the Arthur Anderson accounting firm, which was later overturned; but too late for the company, which was left in ruin by the prosecution. Mueller knowingly hid exculpatory evidence that allowed the framing and imprisonment of four Massachusetts men, in order to protect an FBI confidential informant that had actually committed the crime—murder! When this misconduct was uncovered, to Mueller’s chagrin, a jury awarded the two surviving men and their families a $101-million-dollar settlement for this gross miscarriage of justice. His punishment? As is typical with the DOJ, Mueller received a slap on the wrist; and, quicker than anyone could say J. Edgar Hoover, Mueller was cross-dressed into the role of FBI director. There are now suspicions that the indictment and prosecution of the respected General Michael Flynn was rife with the typical Mueller/Weissman shenanigans. The prediction: McCabe, Strzok, Comey, and Judge Contreras are prosecuted for obstructing justice. Former Attorney General Loretta Lynch is implicated. General Flynn is pardoned or exonerated—United States District Court Judge Emmet G. Sullivan [the Judge who disciplined Weissman in the Senator Stevens’ prosecution that was overthrown by his court] goes as far as he can to right the injustice. The Judge is onto them. Rats have a distinguishable odor in the courtroom. Mueller and Weissman will be sanctioned for misconduct related to Flynn’s case. The election of a Democratic Party rising star, Conor Lamb, in Pennsylvania’s 18th Congressional District is being construed by some as a turning point for the Party. Lamb won the seat in a special election; in a district won by Trump by 20 percent in 2016. While we have yet to make our forecast for the 2018 midterm elections [we have called the past 4 national elections completely accurate, several months out from the election contests] this election tells us more about the message being sent by voters to the DEMS. The voters in the district rewarded DEMS for their choice of a moderate candidate with far more appeal than the leftwing extremists that have dominated the Party and ruled over its demise since midway through President Obama’s second term. In fact, Lamb was supportive of many of the policies implemented by President Trump. Lamb even campaigned against Minority House Leader Nancy Pelosi. The lesson here is not that the district swung anti-Trump, but rather that it responded again to a someone who, like Trump, ran as a more centrist and moderate candidate. This is a formula for the DEMS to begin making inroads in the rustbelt States, where longtime Democratic Party faithful were basically told to go to hell during the 2016 election cycle. More moderate and sane candidates like Lamb will serve the Party well in winning back seats in Congress and Statehouse elections. The only fallout for the DNC would be from any intraparty squabble that might erupt when the radicals in the Party try to purge its membership of anyone advocating a more moderate or sane agenda.